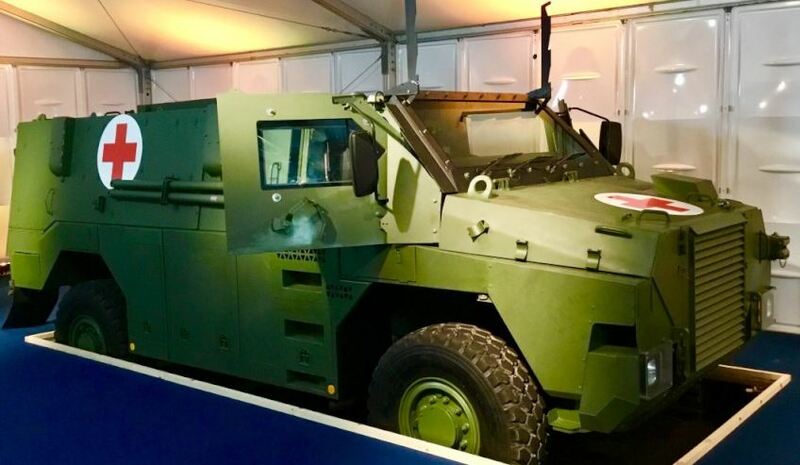 The Thales Bushmaster MR6 in ambulance configuration at IAV 2018. Image via Twitter. Thales Australia has launched its Bushmaster MR6 protected mobility vehicle, which is currently in the running to win the UK’s Multi-Role Vehicle Protected (MRVP) program. The MR6 vehicle was unveiled at the International Armoured Vehicles (IAV) 2018 event this week. The Bushmaster MR6 offers increased blast and ballistic protection and is now powered by a 330-horsepower engine, compared to 300-horsepower for the first version, and has the same maximum range of 800 kilometres. The vehicle also has an increased troop capacity, with 12 people including driver and commander instead of 10. The main visible difference between the Bushmaster MR6 and the original Bushmaster is that the MR6 has no windows on the side of the troop compartment. Defence Industry Minister Christopher Pyne congratulated Thales Australia for the launch of the vehicle, noting that if it is successful in winning the MRVP program, it could support job creation in Australia and the UK. "The Bushmaster is an Australian success story, delivering for the Australian Defence Force, the local defence industry and Australia’s domestic manufacturing capability," Minister Pyne said. "Thales Australia’s new vehicle builds on the original Bushmaster’s battle proven world-class capability, and continues its record of safety and reliability. "The original Bushmaster is widely recognised as one of the finest protected mobility vehicles in the world and is currently in service with eight countries. With the launch of the MR6, I look forward to Thales continuing to deliver top-class capability around the world." Just this week, Prime Minister Malcolm Turnbull confirmed a recent batch of Bendigo-built Bushmasters will soon make their way to their new home in Japan to join the four Bushmasters already in service in Japan. Thales Australia built and supplied four Bushmaster vehicles to Japan in 2014 at a cost of around $3.6 million. The combination of the eight vehicles represents Australia's biggest defence export deal to Japan. The Bushmaster vehicles are produced by Thales Australia and have been in operation since 1997 for the Australian Army, Royal Australian Air Force, Royal Netherlands Army, British Army and the Jamaica Defence Force.